Chiropractic Specialty Center® Treatment Provides Safest and Most gentle Treatment for Back Pain During Pregnancy. Opt for the BEST. Call Us Now! According to research published by the University of Michigan, nearly half of expecting mothers complain of severe back pain during pregnancy. However, a published study in the Spine Journal reported back pain during pregnancy impacts 76% of expecting mothers. Back pain during pregnancy is the result of many factors. 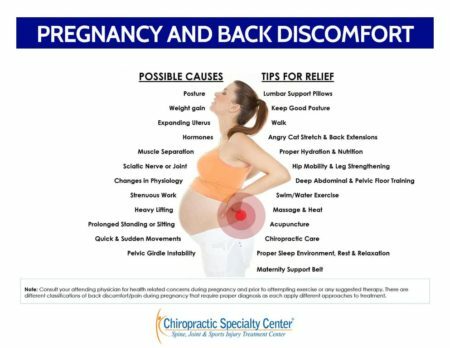 Factors such as changes in body weight and the center of gravity as well as hormonal issues are critical factors in the development of back pain during pregnancy. If you are pregnant or planning to start a family, this article is for you. Lower back pain is a feeling of uneasiness or discomfort along the mid or lower portions of your spine. Often, sufferers complain of radiating pain in the tailbone, buttocks, hips, thighs, and legs. Some may even report numbness, tingling or a burning sensation in their spine or legs. Most mothers complain of some weaknesses in their affected limb. Regardless of location or severity, back pain during pregnancy is an issue that must be addressed holistically, without medication or injections. Pregnancy comes with lots of physical and hormonal changes. These changes are natural and are needed to prepare the body for delivery of the fetus. However, 50% of expecting mothers are unable to cope with the physical changes. The main reason for this inability is our modern daily life. Our modern life has led to decreased physical activity. We sit too much, and when we sit, we sit for prolonged periods! All that sitting has led to weakness in our core and spinal muscles. Generally speaking, mildly weakened core and spinal muscles may not cause symptoms. But, during pregnancy, these issues come to the surface with revenge, causing pain of varying degrees. Besides the apparent increase in body weight, there will change in physical loading as well as hormonal changes. For a more comfortable childbirth, the body will release more Relaxin. This hormone helps to increase ligament laxity. Relaxin is a hormone found in men and women. The letdown in men is from the prostate gland. And as such, Relaxin in men is detected in the seminal fluids. In the non-pregnant women, the ovaries secrete the relaxin hormone. In pregnant women, the ovaries, as well as the placenta, secrete the relaxin hormone. The combined effects from two sources are another factor why pregnant women need to be made aware of the relaxin hormone. In females, the relaxin hormone is secreted into the circulation. In men, it is found in the seminal fluids and not in circulation. The most critical point is that during pregnancy, the placenta secretes it in large amounts. So, in females, there are two sources: the ovaries and the placenta. When the placenta releases the relaxin hormone, significant quantities of the hormone enter blood circulation. The increased presence of relaxin in blood is the key factor in back pain during pregnancy. Thus, the importance of Relaxin-induced joint pain or back pain during pregnancy. Relaxin in circulation, as secreted during pregnancy, impacts ligaments, tendons, and muscles throughout the body. The highest concentration of the relaxin hormone is in the pelvic regions of an expecting mother. The abundance of the relaxin hormone in the pelvic area is critical to the preparation of the body for childbirth. Without the Relaxin, the pelvis will not widen, making the birth of your child an impossible task! The Relaxin hormone is still not well understood. There needs to be further research on its importance and role, especially during pregnancy. As mentioned, it is a hormone released by both males and females. In females, relaxin releases during the reproductive cycle and pregnancy. The ovaries release this hormone during the reproductive period, while the placenta releases it during pregnancy. During the reproductive cycle, Relaxin is released by the corpus luteum in the ovary. The levels of Relaxin are said to rise in the circulation during ovulation. Ovulation occurs in the second half of the menstrual cycle. During ovulation, relaxin prevents uterine contractions by relaxing the uterus wall. The relaxation of the uterus wall is said to prepare the lining of the uterus for pregnancy. However, if pregnancy does not occur, the hormone levels return to normal levels again. To understand the events leading to back pain in pregnancy, one needs a thorough understanding of the pelvis, Relaxin hormone, and childbirth. Without a firm grasp of these essential structures, events, and hormone, the treatment of back pain in pregnancy becomes a daunting task. The clinical teams at the Chiropractic Specialty Center offer unparalleled research-based non-invasive spine and joint care. It is our firm understanding of health issues and their root-causes that enable us to provide you with exceptional world-class spine and joint care. It is also the main reason why we succeed when others have failed. And, when it comes to back pain and pregnancy, we have a better understanding of the root-causes than the rest. So, without further delay, let us explore the link between the pelvis, back pain, Relaxin hormone, and pregnancy. According to a well-researched article published in The Journal of Clinical Endocrinology and Metabolism, Relaxin hormone levels progressively increase during pregnancy. Another research published in the American Journal of Obstetrics and Gynecology reports Relaxin hormone as the critical factor in the development of back pain during the late stages of pregnancy. Both of the above-published articles reported a progressive increase in the levels of Relaxin in blood throughout gestation. The Article published in the American Journal of Obstetrics further related that the Relaxin levels drop to normal levels three months post-delivery. The role of the Relaxin hormone is well established in the development of back pain during pregnancy. Some researchers have put the numbers of back pain in pregnancy as high as 76%, while most agree that is closer to 50%. The one thing that most researchers agree on is that those with a prior history of back disorders are at higher risks of developing severe and debilitating back pain during pregnancy. How to Naturally Heal Your Backache when Pregnant? The Relaxin hormone is a peptide that is much like insulin. This is why the level varies from individual to individual. Some have many higher levels compared to others, and there are those that do not have sufficient levels. Unfortunately, to date, there is no established protocol to evaluate the levels of Relaxin in expecting mothers. Should such a practice be put in effect, the incidence of back pain during pregnancy will decrease. When it comes to back pain in pregnancy, the best treatment is prevention. But, if you experience back pain, you must initiate targeted, focused methods of treatment at the earliest symptoms. The longer you wait, the worse your prognosis. The critical factor is the Relaxin release during pregnancy coupled with weight gain. Muscle and ligamentous laxity in the pelvis, spine, and weight-bearing joints are additional factors that lead to back pain. Weight gain is another key factor. However, weight gain is expected and encouraged during pregnancy. But, for those with a weak core and spinal muscles, it leads to instabilities in spinal joints. As your baby grows, it is natural for you to gain weight. Those gains do impact you, as it changes the center of your gravity. 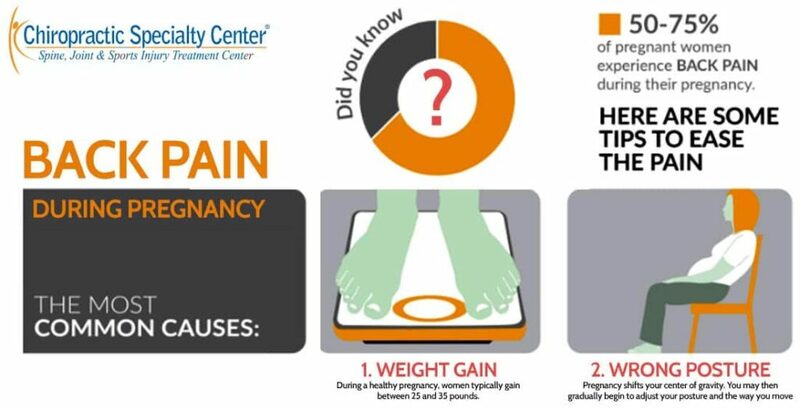 Weight gain during pregnancy occurs at a faster pace past the fourth month of gestation. Incidentally, it is during the fourth and fifth months that most expecting mothers show signs of back pain or joint pain. The change in the center of gravity is gradual in the first four months but rapidly progresses after the fifth month. With increased weight, expecting mothers find themselves leading back more, putting more stress on spinal joints and spinal discs. The change in the center of gravity coupled with an increase in Relaxin in circulation is the turning point for most. As mentioned earlier, Relaxin causes muscles and ligaments to relax. 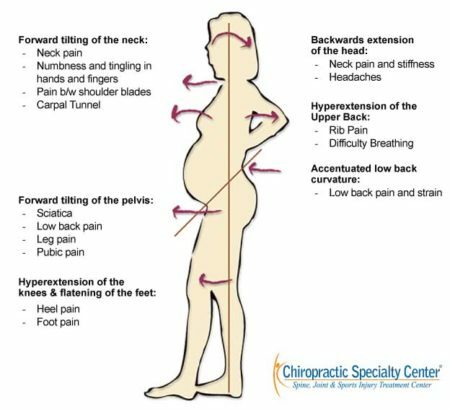 When you couple the relaxation effects of Relaxin with postural changes (changes in the center of gravity), it becomes clear why one develops back pain during pregnancy. Therefore, we encourage every expecting mother to get into a great shape before planning for a family. And of course, getting help from a clinical team like ours is key to having a healthy and pain-free pregnancy and delivery of your baby. We have talked a lot about back pain during pregnancy a lot. It is only fitting to focus on back pain after pregnancy. As we mentioned time and again throughout this page, Relaxin and postural changes have an important role in back pain during, and after pregnancy. Ligamentous laxity (excessive relaxation of ligaments or loss of tone) always leads to the instability of joints. If a person already has a form of back injury or minor degeneration, it predisposes them to pain. Pain results from the increased axial loading. 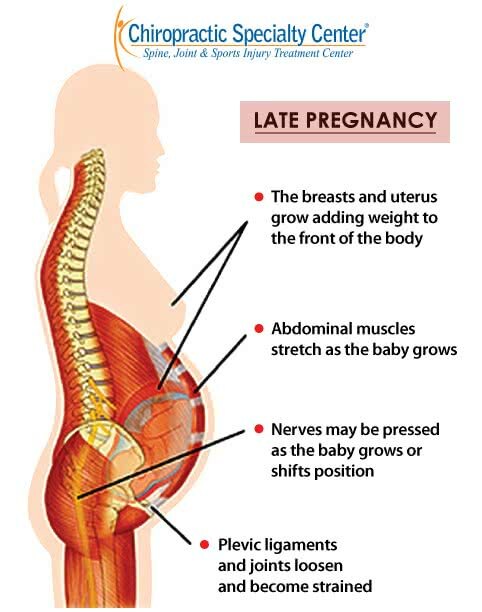 Excessive weight gain during pregnancy can place undue stress on your spinal joints. Stressing your spinal joints can further weaken your spine. For most, this pain lingers on, even after pregnancy. Some may also develop a herniated or protruded spinal disc post delivery. Back pain after pregnancy can occur even if you did not have back pain during pregnancy. The process of delivering a baby is one of the most traumatic events for the mother as well as the child. Should you continue with care with us after You have Delivered? We encourage all our pregnant patients to continue with care especially at our center after their childbirth. Our clinical teams are the experts you need. There are none better than us when it comes to back pain during pregnancy or discomfort after the delivery. Our understanding of this subject, as well as our collaborative methods of treatment, are unmatched by others. Visit one of our centers today and discover clinical excellence in chiropractic and physiotherapy. It is essential when planning for a family to first and foremost, make sure you are in good health. Strengthen your core and back muscles beforehand. Strengthening of muscles in anticipation of the coming changes will enable your body to cope better. So, take our advice and do not put yourself or your baby’s health in jeopardy. Drop by any of our centers to get a physical examination from any one of our trained and experienced Chiros today. Before we start this section, we wish to inform everyone that chiropractic and physiotherapy are your best therapy options. 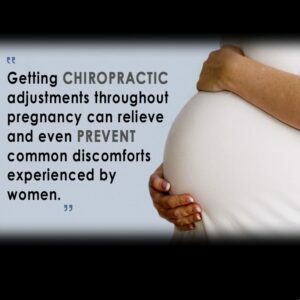 Pregnancy is not a contraindication to chiropractic, physiotherapy or rehabilitation. The only difference is the type of care provided to an expecting mother. Chiropractors have been treating pregnant patients for over a century. The levels of successful outcomes when it comes to the holistic natural alternative is highest through chiropractic care. However, care must be taken to ensure that the chiropractor you visit is thoroughly knowledgeable and experienced when it comes to treatments for a patient during pregnancy. 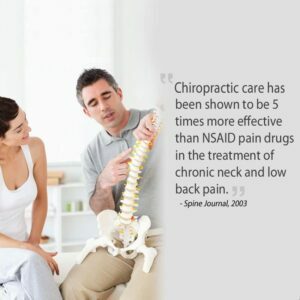 The chiropractic treatment, or the “Adjustment,” is a painless procedure. In our opinion, the best and most accurate means of chiropractic treatment is through the activator methods. The activator method of chiropractic treatments is the least stressful but most beneficial when correctly used. Our clinical teams of chiropractors utilize the Activator tool to provide patients with a targeted means of chiropractic treatment. Our advice to all expecting mothers is to avoid the manual or rotatory chiropractic treatments. The main reason why we recommend avoidance of the manual means of care is the excessive laxity present in expecting mothers and those that recently gave birth. In our centers, we utilize manual modes of physiotherapy as well as treatments rendered through specialized devices for our pregnant patients. Best of all, our physiotherapists and chiropractors work together on each patient. So, if you are pregnant and in pain, there is no better team than the one you can find in one of our centers in Malaysia. Visit us today and get relief from your back pain during pregnancy. 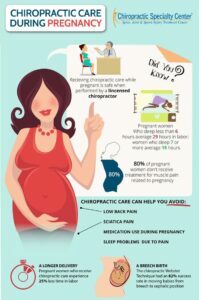 Back pain during pregnancy is common, but it doesn’t have to be!